Some of you may remember my extended whistle-blowing post on the scam known as Bookbrewer. If you missed them, here they are again for your viewing pleasure. Do your homework on self-publishing companies. Now, as I understand it BookBrewer has changed their pricing structure since my original rant about them. That's really a moot point because. Bottom line (in case you just didn't want to click and read the posts) EBOOK PUBLISHING IS FREE from reputable companies. Amazon KDP, Barnes & Noble Pubit! and Smashwords will not charge you a penny to publish your work (you still need to make sure you've done the rest: editing & cover art). If you thought BookBrewer would stop their money-grubbing schemes at e-publishing, sadly you were mistaken. They're back!!! And this time, they want to scam you out of your money by using your dreams of becoming a print author. Now people who have created eBooks with a BookBrewer-branded service can turn their own eBooks into paperbacks that are printed on demand for as little as $4 per copy, plus shipping. Since these special paperbacks start from eBooks, you can think of them as "pBooks." And by pre-ordering now you can lock in a low setup fee of $49.99 per order! Only the first 500 orders will get this special pricing. After setup, you and your readers will be able to order your pBooks with no minimumum (yes they spelled the word minimum incorrectly) requirement of number of copies. Order as little as one copy, or hundreds, and still receive them by FedEx in 14 days or less. You'll also be able to mark up the price for the public to order. That's your profit margin. You must have an ePub file created with a BookBrewer-branded service. We cannot accept eBooks created from other services at this time, although we hope to provide an option for other eBooks in the future. Read more about terms and pricing. Ok, right off the bat I see a problem. This service is only available to people who have bought into their already overpriced ebook scam. It's a crafty little tiered approach at taking your money. What does their current ebook package cost? Anywhere from $19.99-39.99. So make sure you take that into account when you're looking at total cost of this new revolutionary system they're trying to sell you. You have to have an ebook with them first! So let's add up our cost so far. If you slide in at the introductory rate (only good for the first 500 suckers... er... people in the door, your cost are $19.99 (assuming the lowest price) + $49.99 = $69.98 That's just your start up cost. Lets see how that compares to other Self-publishing/ Printers out there. His post touches on these points and was the first I had heard of BookBrewer's new pbook plan. Now, Createspace and LSI are the two most prominent self-publisher/printers out there. I'm not going to start a debate about which one you should use. They both have their fees, their pros and their cons. For interesting discussions about which one is right for you, check these two posts. At this point you might be saying, "Hey, they're cheaper than the printer you work with, why all the fuss?" I'll tell you why. Because upfront cost aren't always the issue. Read on dear reader, read on. To participate, you must first have an ePub file created with BookBrewer.com. Each copy will be printed on 6x9 stock. Includes a full-color front and back cover with perfect binding. Maximum of 500 pages allowed per title. Page layout will be 100% automated based on the content of author's ePub file. No changes are allowed after an order is placed. No ability to correct anything once you've uploaded your precious manuscript to them. This is a HUGE red flag. The inability to fix mistakes as needed is frightening. That's the whole reason you receive a "proof" to make sure that your work has been done correctly and to fix any mistakes prior to production. LSI offers proofs, I know Createspace offers proofs. All of the vanity publishers offer them. Why not BookBrewer? Next we move on to where the real money is made. You've paid your setup fee and uploaded your book. I'm sure you want a copy of it, right? The average book size is somewhere between 200-350 pages. Lets say, for arguments sake, you have a 300 page book. (My recent release Hunters & Prey is 300 pages so I'll be using that for comparison). 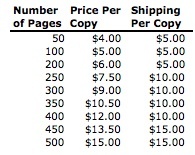 To purchase a single copy of your book, you'll pay $9.00 according to the chart and then another $10 for shipping. Yes, look again, that shipping column is PER COPY. Surely they can't expect you to pay $10 per book in shipping, right? An additional amount for shipping will be added for each title based on the page count (see chart above). Shipping will commence 14 days (or less) after successful receipt of funds, excluding weekends. Note that this means that Paypal orders made from checking accounts will require a longer turnaround time. Customer will receive a Fedex tracking number upon shipping of order. Shipping is only available within the continental United States at this time. Crafty little devils aren't they? So your single copy will run you $19.00. Each subsequent copy you order of the same book will cost you $19.00. They're hoping you'll just skim over the shipping column when you're looking at the "Price per copy." Lets compare that to LSI. So, on one single 300 page book, you pay either $19.00 with BookBrewer or $10.70 with LSI. Now do you see where they get you? Who's going to order just one book? You were planning on sending out review copies of your book, right? What about your family who you promised books too once you finally made it to print? No matter what your situation, as a new, Indie author you'll be purchasing more than just a single copy of your novel. That's all part of the joy of marketing your new baby. You have to send out lots of review copies to get the words out. So let's look at a small order. And remember that shipping charge for BookBrewer are PER BOOK. There is no discount for volume shipping. Let's say you want 20 copies. That's a reasonable starting number to order. With LSI that's $123.75 (3.80 for the initial shipping plus about 0.55 for each additional book). Your individual book cost is only $6.19. You have to sign up for their ebook service (you don't qualify for pbooks unless you sign up for ebooks). You have absolutely no control over your book's creation: no choice in size or paper type. The cover is included so I'm assuming you have no real options there either. There is no proofing or error correcting policy in place (if it comes out looking like crap, you're stuck with it.). There are no volume discounts for ordering more books. Each book is charged the same shipping rate. And, something that has yet to be mentioned. Do they actually have one or is it just available through them? Distribution can make or break an indie author. We are "unknown" to start with. We have to go that extra mile to make it easy for people to find our work. No distribution is a HUGE red flag!! LSI places you in the Ingram and Baker & Taylor catalogs. Createspace also has specified distribution channels too. Please remember to ALWAYS do your homework when considering any part of self-publishing. There are many companies out there that look flashy and talk a good game, but most are only out to get your money. Before we go, just for fun, why don't we take a look at the quality of BookBrewer's pbooks? First Print on Demand eBooks (pBooks?) from Dan Pacheco on Vimeo. Second try! : Writers have tried for years to circumvent the gates of publishing, and there have always been people ready to take advantage of that desperation. I'm glad there are now also real alternatives. Thank you for such a clear explanation. I also appreciated the direct links. It gives me a lot to think about.